MVP is a Pawn Tactics clan that was founded on 07/11/08 by T15M21 & Exclusive. We have a great reputation and community. Our mission is to recruit only the finest. You join MVP as a sign of the gained experience and wisdom. Many MVP Players have gone on to lead the best clans including SVG, LOL, BHS, CSC, CEL, DIG, & ZGX after the clan was forcefully dissipated by moderators Sharpy and HardenedWarVeteran. We do not allow alternate accounts. All MVP moderators must be fine with accepting a member for that person to become a member. What have you accomplished throughout your Pawn Tactics journey? I notice you recruit players of the noob family. I'm in. This clan looks cool, can i join!!!!?!!? Moderator of DSX, WMD, SVG, LSX, etc.. I'll let your score slide this time . No exceptions for alternate accounts? Absolutely not; alternate accounts can only be used for other clans. I have improved my game in the Sandboxd Era and lead a rank one clan. If I may say, I've been quite loyal to PT and have gotten a lot better throughout all these years. Testimony from others about my skills can come out as negative, but I think I just haven't gotten the spotlight on me when the time was right. I think I am decent at PT and active. I have upgraded in my understanding of how to strategically play the game and I will probably keep learning. I'd say my journey was short but I see the fruits now, at this quite relevant time of revival. I'd like to think that the journey starts now. You have my vote of yes. What do you think TDK? We are looking for people who don't see simply themselves as merely decent and who have experienced longer journeys. 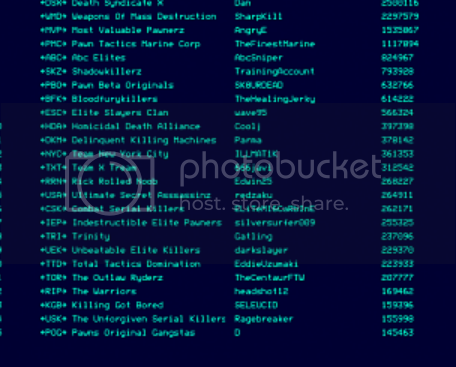 The list is from the old MVP website. If you can get MVP members to vouch that you were a part of it, then I'll add you. "All MVP moderators must be fine with accepting a member for that person to become a member." Maybe I didn’t make this clear. ; I’ve been apart of PT since 2011. Also, experience in what aspect are you looking for? You have an amazing application and it shows that you've grown, but you don't seem too confident in your skill yet. Furthermore, we are looking for team players of whom other players will vouch for strongly, rather than negatively. You can re-apply after two weeks. TDK, FYI I wouldn't say it's accurate to have me in the post-Sandboxd era list (I quit before the Sandboxd era begun). I was in MVP for quite a while in late 2008/early 2009 in the post-beta era.